This month’s first tasting down at our Shop was another stepping out of the confines of grain spirits, this time into the world of boiled wine, specifically cognac. Simply put cognac is distilled wine. There’s a bit more to it than that, with a small number of grape varieties permitted to be used, production having to take place in the Cognac region of France, spirit having to be distilled to under 72.4% ABV, stills having to be direct fired, distillation having to be completed by the March 31st immediately after the harvest of the grapes, bottling having to be done at 40% ABV or over, and a variety of other rules. One of the most important production rules is ageing – all cognac must be aged for at least 2 years in oak. However, that would be way too simple and the cognac makers use the ‘compte’ system of counting. The first day of the year, no matter when the cognac was produced, is April 1st (as the rules state that all distillation is done by the end of the day before) and all ages are calculated from that day, even if distillation happened earlier (possibly up to 6 months earlier, depending on when the grape harvest occurs, as the base wines can’t contain preservatives). The compte system of years is quite simple: 00,0,1,2,3,4,5,6,7,8,9,10. ’00’ is the age until the April 1st after the harvest; then the spirit is 0 until it hits the next April 1st; then 1; then 2; and so on until it hits compte 10, sometime between 10 and 10.5 years after distillation. The numbering system doesn’t go above 10, so from then on it’s all ‘the same age’. 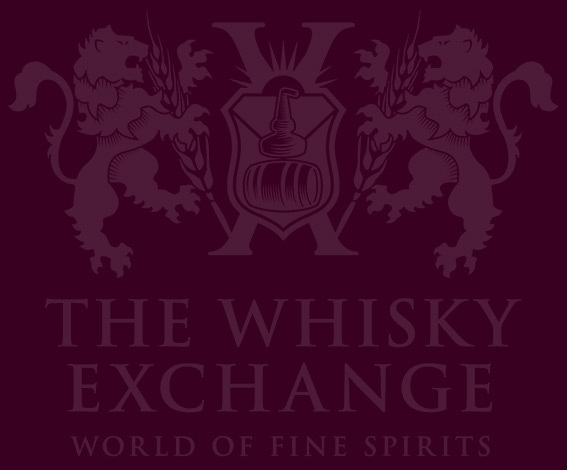 That’s at the moment, as XO is in the process of changing and by 2014 the law will state that XO is instead compte 10 – cognacs aged over 10 years. However, the problem is this – the vast majority of cognac drunk in the UK is rubbish. 97% of cognac produced is exported. 40% of that (38% of total cognac production) is of VS quality – it may stand for Very Special but most of it really isn’t. The law allows for the addition of both spirit caramel (the mysterious E150 that is also used to colour many whiskies) for colour control and sugar to control sweetness, and cheaper VSs (the sort of thing that makes up a lot of that 38% total above) use both additives to the full to create darker coloured sweet spirits. To show what is regularly thought of as ‘cognac’, the sort of thing you’d get if you walk into a pub, we started the tasting part of the evening with an anonymous glass – a ‘Grand House VS’. Over 80% of cognac is produced by just four ‘Grand Houses’ – Martell, Rémy Martin, Courvoisier and Hennessy, with the latter company making up 50% of total cognac sales by volume. The VS we tried is just the sort of thing that you’d find jammed on an optic in a large number of bars and restaurants up and down the country ready to be poured when someone asks for ‘cognac’ or, even more generically, ‘brandy’. What did it taste like? Palate: Caramel, sugar, young spirit…not a lot. It wasn’t ‘bad’ as such, just not very interesting – some caramel richness, and a lot of light and sweet spirit. I stuck some ice in my glass and it quickly faded to nothing: sugar water. Something to mix with Coke for those with a sweet tooth, but not a sipper to be slowly appreciated. We asked around the room to see if anyone could guess where the VS was from and could get no takers, despite their being a few cognac heads in – it wasn’t distinctive and didn’t really show a particular house style. However, not all cognac tastes the same. 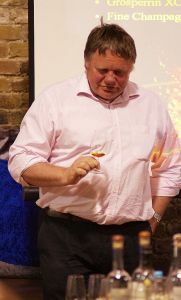 To show us quite how different cognacs can be Ed had a dig around in the warehouse and found 3 sets of paired bottles, matching up similarly named and produced cognacs from two producers which were anything but similar in the end. Before they were introduced we were directed to pairs of glasses on our tastings mats marked A and B – new make spirits from the two houses we were going to try cognacs from. One was buttery and fruity, the other delicate and full of citrus with a stony edge – both very different despite similar production. First up was AE Dor, named for Amédée Edouard Dor and founded in 1858. M.Dor was a cognac negociant, a buyer and seller of casks, who got a bit carried away and ended up being a producer. We compared those to cognacs from Grosperrin, the trading name for La Gabare, a much younger house only founded in 1992. In a similar fashion to AE Dor the owner got a bit carried away with cognac and started production, although he was a noted collector before he got his hands dirty at the sharp end of production. 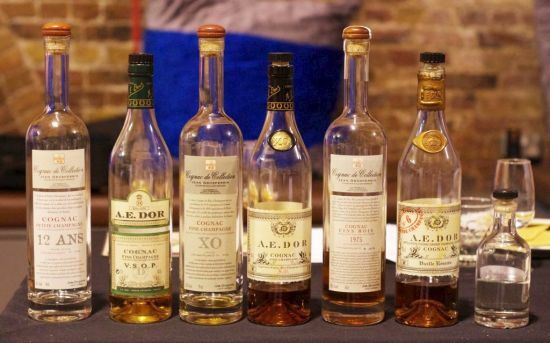 They are both from quite different areas of the Cognac region, with AE Dor being based on the borders of Grande Champagne, the most prestigious region for growing cognac grapes, and Grosperrin sat on the Fins Bois-Bons Bois border, regions four and five out of six in the rankings. They reflect their terroir in the characteristics of their cognacs, with AE Dor known for heavier spirit and Grosperrin for lighter. We kicked of the tasting with a pair of VSOPs – Grosperrin 12 year old Petite Champagne (the second most prestigious growing area) and AE Dor’s Compte 8 VSOP Fine Champagne (a designation meaning a mix of grapes from both Grande and Petite Champagne with at least 50% Grande). Nose: Chocolate and spice, sweet lemon, maple syrup, spiced cake. Nose: Earthy tobacco, smoky, sour raisins and a big meatiness. Palate: Big fruit and spice, thing caramel, black tea, bitterness creeps in with dark wood notes. Nose: Big zesty lemon, orange juice, concentrated sweet citrus, raisins. 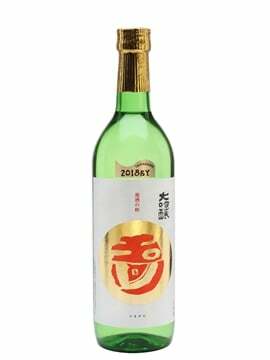 Palate: Sour fruit, sweet floral syrup, fragrant white grapes, tannic fruit skin edges. Finish: Spice and sour fruit. Nose: Rich and oily but fairly closed. Sweet wood, some violets and the beginnings of an earthy ‘rancio’ note – a flavour that I often described as ‘slightly damp autumn forest’, but which has a bit more to it than that. Palate: Sweet up front, oily, fragrant wood, woody spice and light bitterness. Our final pair upped the ‘specialness’ a bit further, moving into rather old cognacs. The first was Grosperrin’s Fins Bois 1975, bottled in 2009 at 34 years old. Vintage cognacs have a bit more effort behind them than vintage whiskies, as casks that are going to be used in vintages are stored separately to regular casks. 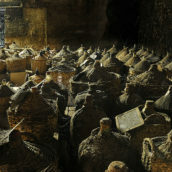 The vintage cellar has to be double locked, with one key looked after by the BNIC (Bureau National Interprofessionnel du Cognac) and one by the cellar owner, and the casks have to be wax sealed by a representative of the BNIC to stop unauthorised tampering (including nosing and tasting). Grosperrin have made this cognac even more unique by bottling it at cask strength, quite a rare thing in the world of cognac, and as a single unblended cask. It yielded just 166 litres of spirit, less than 240 bottles, making it a small release even in the world of artisanal cognac. Nose: Spiced dark chocolate, quite pokey alcohol notes, cinnamon spiced stewed apple, grapes and raisins. 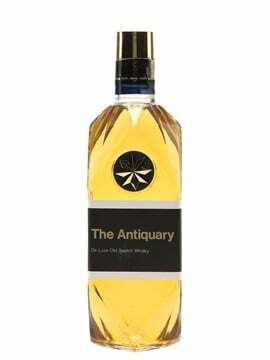 Palate: Sweet spice, sweet wood, lots of citrus, concentrated raisin, sour apple and some damp wood rancio. Finish: Dark tannins and sweet fruit. The AE Dor counterpart was their No.6, a Grande Champagne cognac matured for at least 25 years. It’s quite different to the Grosperrin in style, being diluted to the regular bottling of strength of 40% and being produced in an ongoing fashion, blended from the old casks kept for their Vieille Réserve range. Nose: Dark Chocolate Fruit & Nut bars, well-integrated fruit and spice, dried apricot, prunes, fresh crunchy rhubarb, elderberries, brown sugar and dark caramel. 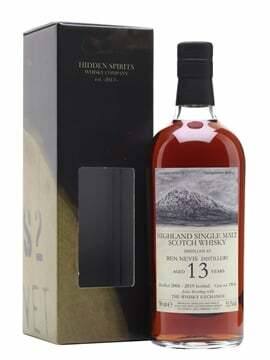 Palate: Soft and oily with sweet pastry, spiced apple, floral syrup, honeysuckle and rich caramel. Finish: Sugar encrusted flower petals, hints of sweet black tea. 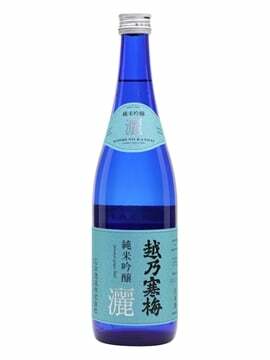 I then went back briefly to the anonymous VS – compared to the AE Dors and Grosperrins it didn’t have any complexity, it was like a sweetened new make spirit. There is some great cognac out there; unfortunately (as with so many other spirit categories) it’s not getting out to enough people. But this was a great way to start changing that – many thanks to our maestro Ed Bates for illuminating this very special category for us.